As the Conference Quarterfinals wind down, the first Semi-Final matchup was set last night after the Los Angeles Kings defeated the Vancouver Canucks in overtime, 2-1. The Kings finished off a historic upset of the Presidents’ Trophy winners, winning the series 4-1. 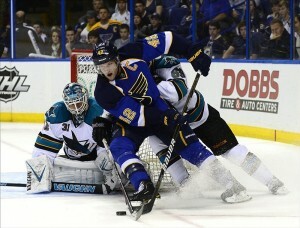 They now will move on to play the #2 seed St. Louis Blues, who eliminated the #7 San Jose Sharks in 5 games as well. While other teams fight for their lives or head to the golf course, it’s time to take a look back at the regular season series between these two teams while they wait for the semi-finals to begin. Just look at those scores. The Blues and Kings have combined for just 12 goals in 4 games, with 1 of those actually being a shootout goal. There have been 4 shutouts technically since both teams received a shutout in that final shootout win. I’m guessing (but not advising) that the under will be a very safe bet throughout this series. With three one-goal games, including the 1-0 shootout finale, some long overtimes would probably be a safe bet as well. Both teams underwent coaching changes early in the season, so those October and November results are probably a little further away from the truth than what fans may see in this series. These teams have made it this far based on team defense and fantastic goaltending. In the regular season, the Blues were the best team in terms of goals against per game (1.89), while the Kings were second (2.07). Looking at goals for per game, the Blues averaged only 2.51 (21st in the NHL) and the Kings were even worse, averaging 2.29 (29th in the NHL). 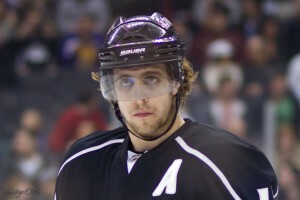 Anze Kopitar (C) – Kopitar is the key to LA’s offensive creativity, though I’m not sure what that says for a team that is frequently offensively-challenged. He led the team in goals (25), assists (51) and points (76), and averages the most ice time for forwards on the team. He is dynamic with every shift and has very underrated playmaking skills as a center. Dustin Brown (RW) – The Kings’ captain had a rather slow season by his standards until trade rumors flared up about where he could be moved to. Brown then caught fire for the last month of the season, powering the Kings into the playoffs by acting like a true power forward. Brown led the team in hits with 293 and tends to lead by example, both with physical play and on the scoresheet. Drew Doughty (D) – The start of Doughty’s season was slow and marred by a training camp holdout. Though it took him a couple of months to get his game together, Doughty found his offensive touch in the second half of the season. He scored 10 goals and assed 26 assists as the team’s leader in ice time (24:53/game). His fluid skating style and stellar puck handling make him a threat on both sides of the ice at any point. Jonathan Quick (G) – Ask anyone how the Kings made it this far, and they will answer instantly with Jonathan Quick. I have written previous articles about how Quick should earn the Vezina, along with a Hart nomination for his work in the regular season. The reason: 35 wins, a 1.95 goals against average, .929 save percentage, and 10 shutouts. Quick will keep his team in every game, regardless of who their opponent is. David Backes (C) – Backes is in many ways the ultimate team player. He can score or he can fight. He can give the team quality minutes on the powerplay, or the penalty kill. He will simply do anything he can to help this team win. Today, he was nominated for the Selke Trophy as one of the league’s best defensive forwards. His leadership skills and work ethic as captain keep this team ticking. Alex Pietrangelo (D) – As a young defenseman, who will drive many people crazy with his last name, Pietrangelo took multiple steps towards a future Norris trophy candidacy with his development this season. He led the team in ice time, playing almost 25 minutes per game, and was the highest scoring Blues defenseman with 51 points. His 39 assists were a team high as well. He shows great awareness in the defensive zone, and transitions between offense and defense seamlessly. He gave the Blues a big threat from the point, finishing 2nd on the team in shots (202) and 1st in game winning goals (6). David Perron (LW) – Perron missed the first 2 months of the season as he recovered from a concussion, but came back with some beautiful theatrics by scoring in his return game. He is likely the most natural scoring threat on this team, accumulating 42 points in 57 games, but can play a defensive role and on the penalty kill just as well. Brian Elliott (G) – Elliott combined with Jaroslav Halak to earn the William M. Jennings trophy for the team with the lowest goals against average in the league. His stats were impressive to begin with, but even more so based on his games played. In just 36 starts, Elliott finished with 23 wins, a 1.56 goals against average, .940 save percentage, and an astounding 9 shutouts (1 every 4 starts!). Jaroslav Halak is expected to be out at least for the first two games of the series, so I will keep Elliott as the key for now. He could very well receive a Vezina nomination as well, so this may be quite the goalie matchup. This series is essentially guaranteed to produce tight-checking, hard skating, drama-filled close games with the personnel involved. The result could go either way as Elliott and Quick will surely put on clinics in net, leaving goals to bad breakdowns or lucky bounces. I will break down their playoff paths later in the week, but based on their regular season history, don’t be surprised by a 1-0 score…or seven of them.